Any device needing monitoring or power scheduling control. Our Windows based RPS software makes it easy and affordable to detect network and website failures early. You can now monitor critical network resources, immediately detect system failures and if desired, automate the reboot of remote devices over the telephone line, to minimize downtime. The RPS Software can monitor devices and servers located in the Internet, Intranets, VPN networks or schedule power on and off events & more! The Power Stone RPS II software component adds greater flexibility, security, monitoring, and scheduling to its power control functionality. 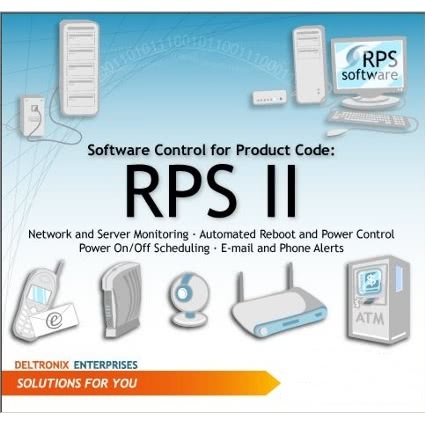 From your centralized computer station, the RPS Software allows you to have complete power control over your network. It fully monitors and/or schedules power cycling of configured devices. Instead of manually telephoning your RPS device, the software utilizes a modem to send the control codes over the telephone, automatically allowing for reboot, power on and power off commands per your pre-defined actions. These requests can consist of either a scheduled (turning any configured device on, off or reboot i.e. routers, servers, switches, webcams, firewalls, DLS Modems, ATMs, lighting, signage, air conditioners, or other electrical device plugged into the RPS II Unit ) or a monitored event. Your ‘pingable’ or https:// accessible device can be monitored by the software. When a predetermined number of failures occur (user definable), an email is sent to notify you of the failure. If additional failures occur and your reboot threshold is met, the software picks up the modem to call the Remote Power Switch device and issues commands for a reboot. If the device returns to normal status, you are informed via email. If the device continues to fail, additional reboots are performed up to your set definable limit. Once this limit is met, a final email is sent to notify you of the failure of the tested device and reboot activity is halted. As internal network problems can occur, the software also has the (optional) ability to verify a failure by contacting a specialized web application located on Deltronix Enterprises servers. The application allows for verification of a detected failure on your network from a external source. This verification involves pinging or a https:// connection to the same device that the RPS Software is monitoring as a failure. If the test passes, the software error count is reset and email notification is made. If the failure is confirmed, the software continues with its preset instructions to reboot. If the program cannot be reached for whatever reason, the software performs its designated tasks. 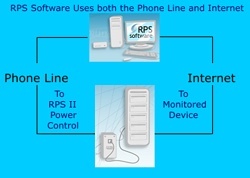 The RPS software also allows for power off, power on and reboot scheduling. Up to 10 predefined schedules can to implemented per RPS unit. (more schedule events are available.) For instance, you can have a reboot performed daily at 11am. Have a ‘one time’ reboot scheduled, or setup a weekly or monthly schedule. You can power on a device at 10 am on one day and power off the device at 2 pm on another, if so desired. All scheduled activities include notification to your specified email address. The RPS software monitors its own internet connection. If a failure occurs, the software picks up the phone and dials your cell phone, or other designated telephone number, and issues a tone warning of the failure. If the internet connection fails, all testing of designated devices is halted until the internet connection is pingable. The RPS software monitors the modem. On a preset interval, the modem is checked for connectivity. You may also optionally check for dial tone. If a modem failure is detected, an email is set to your designated address to warn you of the failure. A log is maintained of each RPS Unit showing activities that were performed. Additionally, a system log is maintained of rps software modem and internet connectivity. In the main window of the program, you can quickly scan all your devices and determine which of them is in failure mode, active, scheduled or inactive. The software versions are available that can control from 1 to 250 RPS II Devices. With further customization, and on specialized orders, up to 2000 RPS devices can be monitored from a dedicated computer! We also have generated an online demo which steps you through the features and setup of the software. Click Here to view this demo. To view the online demo you must have installed Macromedia’s Flash Player. If you have trouble viewing the demo, please download the latest version of Flash Player. It is important that you read the RPS II instructions to fully understand the operational characteristics of the RPS II Unit before viewing the online demo of the software. To request a FREE 14 day demo of the program click here. System Memory of 512 MB RAM to 4GB or more depending on your operating system. About 8 MB of hard disk space for software installation with additional space needed for the log files. This version of the software uses a voice / data modem for operation. You must test, to your satisfaction, that the telephone , modem, internet connection and command set is operational for your needs. Deltronix Enterprises assumes no liability for failure of the software to perform. For monitored events ,the software determines the success of a reboot by checking the ping and http response of the device to determine if the device is active. For scheduled operations, the program allows for multiple calls to the RPS unit, and issuing of the same commands, to assure that the event will be carried out per instructions. A log file is maintained of all activities for follow up along with email notification of activities. The software is available in a 14 day demo for full evaluation before purchase.